Before starting any exterior work, contact Reuben McKnight, our city Historic Preservation Officer, at 591-5220 or e-mail. He can tell you if your project needs a design review and how to proceed if it does. You may download the guidelines from the City of Tacoma here. Located at the corner of North K & North 8th Streets, the park has been a project of the North Slope Historic District, the City of Tacoma and the North End Council. North Slope residents suggested the idea in the early 1990s, but the North Slope Historic District had no money to proceed. Our representatives on the North End Neighborhood Council eventually secured the funds from the Thea Foss Bond Issue given to each neighborhood council, but it took years to work out the transfer of the property from Tacoma Power to the City. Metro Parks was the designing and developing agency, although the property is owned by the city. The small park contains a wooden piece of play equipment for small children, seating, handicapped ramp, and plantings. The design and equipment in the park were approved by the Landmarks Commission. The park's maintenance is done by Metro Parks. The park is dedicated to Valerie Sivinski, former Tacoma Historic Preservation Officer who provided guidance for the creation of the North Slope Historic District. Neighborhood volunteers maintain the beds and plants that we originally planted that help to make "Valerie's Park" special. Everything is growing well and looking good. Thanks to all of you for picking up and helping keep our gem of a park tidy. The North Slope Historic District is nothing without residents that generously donate their time and effort to help make our neighborhood what it is today. Quite simply. . . we need you as well. To learn more about serving on any of the following sub-committees please e-mail us or contact any member of the board. Have a question regarding your home or the NSHD? Find your home on the National Register. A collection of useful links to Tacoma services. 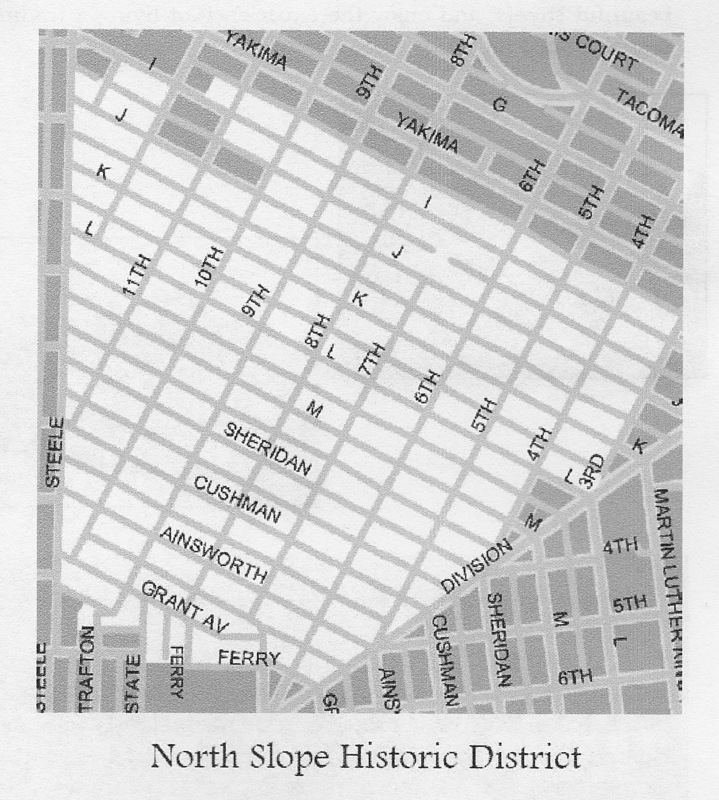 The North Slope Historic District, Inc., is a non-profit 501(c)(3) organization. Copyright © 1996-2019 tacomanorthslope.org. All rights reserved.